Follow the Greybeards' advice to learn a Word of Power from a word wall. The list of word walls you will not be sent to includes the following, most of which have an associated quest. In addition to those listed here, no Dawnguard or Dragonborn word walls will ever be targeted by this quest except Arcwind Point. "You have learned so much already, Dragonborn. Growing your gift too quickly would be dangerous. 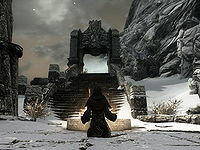 But there are many Words of Power in Skyrim, carved in the Dragon tongue. Even from here, we can feel the Thu'um resonate from them. Finding these lost Words would be a sufficient test, to temper your abilities with experience. Ask when you are ready to search." "There is only silence right now. Perhaps later we will hear one of the lost Words." "We have felt the whisper of a Word. Give me your map, and I will show you where its echo can be found." The latter response will cause the location of the word wall will be marked on your map, and you will be given a new quest objective. This quest can be repeated multiple times, and it can also be active simultaneously with the other word wall quest, Shout - learn about word wall. Both quests can even point you to the same location as the other. However, if you choose to kill Paarthurnax for the Blades, this quest is no longer available. If sent to Arcwind Point, finding the word wall may not mark the quest as completed in your journal. Arcwind Point may be given as a destination even when the word wall has already been found, preventing progress in the quest. This bug is fixed by version 1.1a of the Unofficial Dawnguard Patch. Using the command SetStage FreeFormHighHrothgarA 20 will end the quest and allow you to acquire another quest normally. Setting Arcwind Point as cleared via SetLocationCleared fd685 1 will prevent getting sent there again. If you learn a word from a different word wall from the one that Arngeir points you to, the test may be prematurely logged complete. For instance, after being directed to Shearpoint by Arngeir, visiting Lost Tongue Overlook instead can complete the quest. This is another possible solution for the Arcwind Point bug mentioned above. The following empty quest stages were omitted from the table: 20. On the PC, it is possible to use the console to advance through the quest by entering setstage FreeformHighHrothgarA stage, where stage is the number of the stage you wish to complete. It is not possible to un-complete (i.e. go back) quest stages, but it is possible to clear all stages of the quest using resetquest FreeformHighHrothgarA. This page was last modified on 13 April 2019, at 17:25.